Audio: 2015 - "50th Anniversary Collection 1965"
This yearly page now contains all the details of the 2015 Columbia/Legacy "50th Anniversary Collection 1965" 208 track download-only set released in the USA only. This set was available only to purchasers of The Bootleg Series Vol. 12 - Bob Dylan 1965-1966 The Cutting Edge Collector's Edition. My preliminary timing of the set is 15:22:27. This would have required around 20 LPs (or 12 CDs) to add to the 18CD Collector's Edition set! Several of the tracks are already listed as rarities on Searching For A Gem, including those on the Don't Look Back VHS and DVD releases, see VHS & DVD 1960s (original VHS and laserdisc releases), VHS & DVD 2000s Part 1 (2000 VHS and DVD releases) VHS & DVD 2000s Part 4 (2007 DVD and Blu-ray releases), VHS & DVD 2010s (2015 DVD and Blu-ray releases) - at last we can positively identify them! 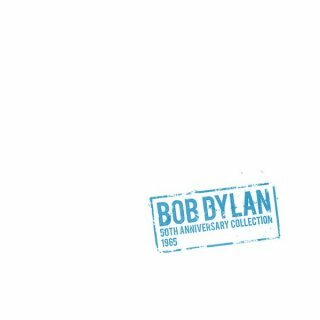 This was available on bobdylan.com as BDC60 (see Online Performances (bobdylan.com) ) where the date of the Sheffield show was given correctly. However, it's definitely not Sheffield, see below, and its actual date is from City Hall, Newcastle, 6 May 1965! R-0297-4 Love Minus Zero/No Limit - The Oval, City Hall, Sheffield, England, 30 Apr 1965, misdated as City Hall, Newcastle, England, 6 May 1965 (wrongly shown on the 2000 Don't Look Back DVD insert as 9 May 1965, which was the date of the first Royal Albert Hall show in London). However, unlike R-0294, this actually is from Sheffield, see dating information in VHS & DVD 2000s Part 1. R-0718-2 Love Minus Zero/No Limit - Royal Albert Hall, London, England, 10 May 1965, from Martin Scorsese documentary film Bob Dylan: No Direction Home, DVD release, Sep 2005, see VHS & DVD 2000s Part 3. Both the 9 May 1965 and 10 May 1965 performances of Don't Think Twice, It's All Right are included on this 208 track download set. Which performance this is is yet to be identified! Other songs recorded during the May 1965 UK tour including R-0403 (It's All Over Now, Baby Blue, recorded in a hotel room, Savoy Hotel, London, England, 8 May 1965) are on CD18 of The Bootleg Series Vol. 12 - Bob Dylan 1965-1966 The Cutting Edge Collector's Edition. Bob Stacy has conducted an extensive analysis of the live performances and has come up with these conclusions. I don’t believe we know yet what has happened or when (we may never know) – but it is fairly obvious that there is some sort of mix up between the Sheffield and Newcastle recordings as evidenced in the respective download file sets for 50th Anniversary Collection 1965. If it weren’t for the 6-song audience tape from Sheffield to use in comparison, it might’ve been more difficult to detect and know for sure. As I said, we don’t know everything but a few things could be coming into light. At very least, the first six songs in the Newcastle download files (#76–#81) are the performances from Sheffield. Those match the performances on the Sheffield audience tape. To my ears, the seventh Newcastle download file (#82 - Mr Tambourine Man) is also probably Sheffield since it seems to have the same general ‘sound’ characteristics (echoey line audio) as the preceding Sheffield performances. The remaining files in the Newcastle file set have a ‘sound’ characteristic which differs from the way the first seven files in that set sound. I believe we also have at least two first half Newcastle songs to use in comparison. A complete The Times They Are A-Changin’ (Don't Look Back Outtakes) and a complete but mislabelled To Ramona (DVD bonus audio track). Both of those match the first two tracks (#16 and #17) in the Sheffield download files which indicates those two files are actually the Newcastle performances. The first seven Sheffield download files have a common ‘sound’ characteristic which differs from the way the remaining files in that group sound. It seems likely that the first halves of these two concert recordings were switched and/or mislabelled. When, where and how that may have occurred is only conjecture. However, two of the DVD bonus audio tracks related to Sheffield and Newcastle also weren’t correctly identified and labelled in previous official releases. Sheffield and Newcastle are concerts where there were reports of microphone failures & possible mic change outs possibly occurring at the midway point or not long afterward. Some of the circulating video evidence from those two shows suggests as much. Likewise, there’s evidence of sound problems heard in these 50th Anniversary Collection 1965 files. Note: (#23 – Talkin’ WW III Blues) is apparently an audience recording, indicating that a suitable line recording of that song wasn’t available possibly due to temporary sound problems during the concert. Note: During (#84 – Don’t Think Twice) there may have been a line dropout or mic failure. Dylan interrupts to ask, “Is the microphone off?” before continuing. A performance of Don't Think Twice was filmed by Pennebaker (was it Dylan at Newcastle or another concert?) and included as a partial clip in the DLB film. The Newcastle performance (#84) is not the audio for that clip. As it turns out, the Manchester audio was apparently synced to that brief video of Don’t Think Twice in the film. Manchester is the far superior performance of that song. Manchester is also the apparent source of the Don't Think Twice version heard on the Retro Rock Radio Show discs. R-0402 Don't Think Twice, It's All Right – this is not Newcastle but rather Manchester, England, 7 May 1965. Because of its placement within the Don't Look Back film and its identification as Newcastle in the Don't Look Back Ballantine paperback book, it had long been assumed that this performance was from Newcastle. Actually, there are visual clues (Dylan’s shirt, the microphones and mike cords) indicating that the video of the song is not from Newcastle but is actually from Manchester. With the release of 50th Anniversary Collection 1965, it is now clear that the Newcastle Don’t Think Twice is quite a bit different from what is heard in the Don't Look Back film soundtrack and also different from the near-complete version available as the Retro Rock Radio Show track. The audio is the performance from Manchester with only slight edits made at the very beginning to exclude the opening applause when Dylan starts singing his first line and also to remove a barely audible cough or clearing of the throat he makes before singing "If'n you don't know by now". The corresponding section of the “real” Newcastle recording, following its partial false start, seems the most likely source for those edits. The first half of this concert, files #107 – #113, is the same as the circulating Royal Albert Hall audience tape. The second half, files #114 – #121, are from a line recording. Love Minus Zero/No Limit – (as verified previously) is Sheffield – 30 April 1965. It is the same performance as the correct Sheffield file (#81) in the 50th Anniversary Collection 1965 download set. To Ramona – (as suspected previously) is Newcastle – 6 May 1965. It is the same performance as the correct Newcastle (#17) in the 50th Anniversary Collection 1965 download set. These bonus audio performances are all the same as those in the 50th Anniversary Collection 1965 file set for 10 May 1965. They are different from the respective performances in the 50th Anniversary Collection 1965 file set for 9 May 1965. The versions in the 9 May files are the same as those on the circulating Royal Albert Hall audience tape. Note: The RAH audience tape has historically been dated as 9 May. At one time or other, there were reports and discussions that it might have been misdated and was actually from 10 May. I don’t recall specific evidence as to why the 10 May date should be the more correct date. As far as I know, most discographers still go with a 9 May date for that tape and likewise accept a 10 May attribution for the RAH bonus tracks. The versions in the 50th Anniversary Collection 1965 download support the attributions provided for the RAH bonus tracks in the DVD releases (2000 and 2007). Conventional wisdom follows that the original audience taper would’ve known which concert was being taped. It is possible that somewhere along the line, dubs from that tape might’ve been mislabelled or left unstated by others. It seems a stretch that the Nagra line recordings for both of these concerts would have also been switched or mislabelled. Dylan’s remark at the end of the Baby Blue bonus track, “I’ll see you next time,” seems more of a farewell until his next visit to England than a goodbye until the next evening’s concert. Thanks to Fred Muller for pointing out that the spoken content of the show, available on several bootlegs, has been cut out. All the UK concert recordings are soundboard, except where shown. The correct Sheffield tracks are #76-#82)! This track is from a different source from the other Sheffield soundboard recordings, perhaps because of a tape machine breakdown. The correct Newcastle tracks are #16-#22)! Alternatively, this is possibly the Newcastle performance of To Ramona, in which case it's the same as R-0294! It's All Over Now, Baby Blue was released on the 2007 Columbia DVD release The Other Side Of The Mirror: Bob Dylan Live At The Newport Folk Festival 1963-1965, (R-0303, see VHS & DVD 2000s Part 4). The recordings of the Hollywood Bowl concert are taken from the PA system, not the soundboard or an audience recording. Considerable research by Dylan fans has determined that these four performances are actually from Chicago, IL, 26 Nov 1965! All songs written by Bob Dylan except "Baby, Let Me Follow You Down" arranged by Bob Dylan. This is the only recorded performance of this song by Bob, the performance on the 1975 double album The Basement Tapes is by The Band with vocals by Rick Danko. The song was performed live by Bob on other occasions in late 1965, but this is the only known recording. Thanks to Bob Stacy who writes: "In the "Chicago Tribune", 27 Nov 65 (the day following the show at Aire Crown Theater, 26 Nov 65), the reviewer Bruce Plowman noted, "Dylan introduced a new song last night, one which he wrote, called 'Long Distance Operator'." Also, Bruce says someone who attended the show at San José, CA, 12 Dec 1965, remembers hearing the song. No studio version is known. The Berkeley tape was recorded by Allen Ginsberg. However, Stephan Pickering says: "Allen Ginsberg donated almost all of his archive to Stanford University's Special Collections. MO 733, Ginsberg Papers Subseries 11.b. Reel-to-reel tapes; 7 in. Box 119, Reel 7. "Bob Dylan, San José, CA, Civic Auditorium, 12 December 1965"
Box 120, Reel 1: "[Untitled] 1965 Dec 12"
I have not had the opportunity to listen to Box 120 Reel 1, and I would like to know who has re-identified these tapes, and on what documentary basis. No doubt, these are the Stanford archived tape reels. This means the Berkeley 4 December 1965 (Box 134 Reel 5) released by Jeff Rosen is actually 11 December 1965 San Francisco. What happened to 4 December 1965 Berkeley? I was there, and saw Reb Allen taping the electric segment, the acoustic 'Freeze Out' premiered that night, but he wasn't able to tape it." Stephan Pickering later says: "The Berkeley December 4th show does NOT exist. It has been mislabeled all these years, it is actually the San José set. The electric set from San José is the exact circulating recording that has been available over the years labeled as Berkeley Community Theater." It would now appear that Box 134 contains the entire San Francisco Masonic Memorial Temple concert from December 11th, complete acoustic and electric sets (except for She Belongs To Me which is missing). The San Francisco show immediately enters the "best concert of his career" conversation. It is an unbelievable listen. Dylan's interaction with the audience is special here, the entire crowd is sitting on the edge of their seats. The San Francisco show is of lesser sound quality on both acoustic and electric sets, but still very good. In the San Francisco electric set Dylan's vocals are higher in the mix than on the San José tape. The San José electric set is a sound quality upgrade from what has been circulating. Dylan says to Ginsberg during the intermission of the San José show that "what you are seeing now is a typical concert, last night was wild, I sort of felt who they were out there". Bob was still very much beaming from the SF show 24 hours later. The tracks from these two shows have not been given R-numbers because they are not officially released. They are however available on the Internet. Thanks to Bob Stacy, Harold Lepidus, Stephan Pickering and "The Bridge" issue 54, pages 103-107, for information.